When it comes to any kind of magazine retention, there are a lot of options out there, and more popping up every day. For carrying rifle magazines, I like a lightweight chest rig. Pistol magazine are a different story, as most chest rigs are designed to feed rifles, with pistol magazine carriage left as an afterthought. With MOLLE/PALS webbing being the current standard, this isn't hard to fix in most cases, but it is an extra piece of gear you'll need to buy and add and test. I run my pistol on the right side of my belt, with magazines typically set up on the left side, directly opposite the pistol. For me, indexing rifle and pistol mags are two different sets of muscle memory, so its not an issue for me to grab the right magazine at the right time. Believe me, I've grabbed the wrong magazine at the wrong time in training, and it prompts a special kind of facepalm. With magazines on my left hip, I've got quite a few choices, each with a few key advantages and drawbacks. Kydex is great, and if I had to run one dedicated system for one gun, Kydex would be it. But that's also the problem, as some systems are molded to a particular type of magazine. Also, a lot of traditional Kydex pouches have a large footprint on the belt for their mounting. There are a lot of designs out there that have none of these problems, and the material is showing great promise as people really learn to wring out its potential, but I don't feel its 100% as good as it could be. MOLLE pouches are a decent emergency option, or something you can use if you forget your mag pouches, but not ideal without a dedicated setup like a battle belt. Thread-through pouches are an option as well, and Glock makes a great line of them for their pistols. If you're one of those people that don't shoot a Glock, this doesn't do you a whole lot of good. Eventually I ordered a magazine carrier from Israeli Tactical through CDNN. Although this pouch had quite a few features I was looking for in a piece of gear like this, the biggest attraction is the price. I'm pretty sure I paid $7-8 for this thing. 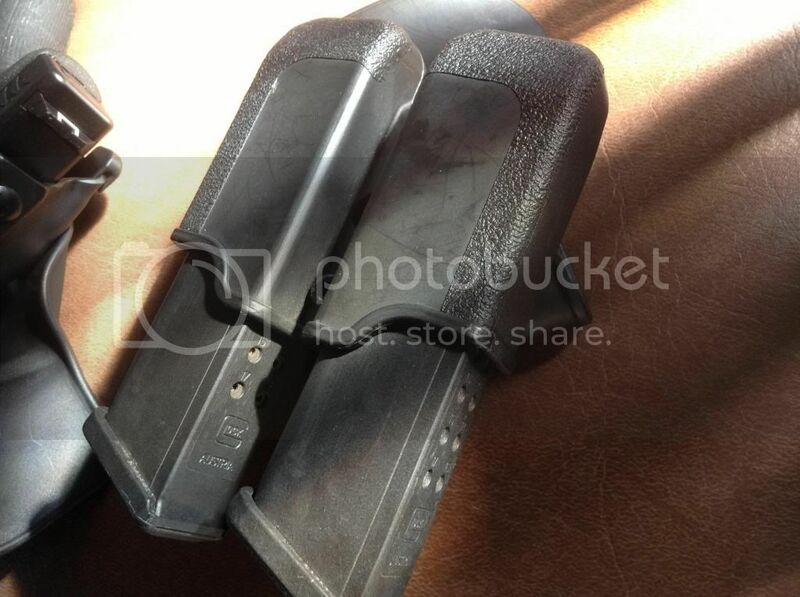 It is at appears, a polymer double mag pouch that is adjustable for tension and cant using a supplied allen wrench. There's enough info online if you want to look at the specs, so I won't go over it again here. Now, I need to say this: an $8 polymer dual mag pouch is something I think will be cluttering up my workbench after it breaks. For those who aren't familiar, most Israeli kit tends to be rugged-often to the point of seeming over engineered, generally polymer, touted as "the choice of special forces teams" or something similar, and appearing under a variety of names. None of this is bad in certain applications, and there are a lot of shooters out there that swear by their CAA or Mako kit, and there are a lot of reasons to do so. One of those big reasons is price. If you are a person who shoots every now and then, and not jumping out of planes, what do you really need for carrying your magazines? That's all relative, of course, but you get the point. If I were being sent to a two way range, would I use this? Yes, but I wouldn't trust it 100%. Why? Well, I haven't been shot at while wearing it. But I can say that about most gear. There are times where a weapon or a piece of gear is so reliable or well-made that if it fails its a genuine shock. That is the kind of gear I would like to have if I was going to war. However, if I'm not, how much do I spend on the system that I might have to use in the direst yet (hopefully) rarest of circumstances? Again, that's relative, but definitely a factor when ammo, optics, gear, gas, etc are totaled up for each trip to the range. So, if price is the primary selling point, does this thing work? The short answer is yes. 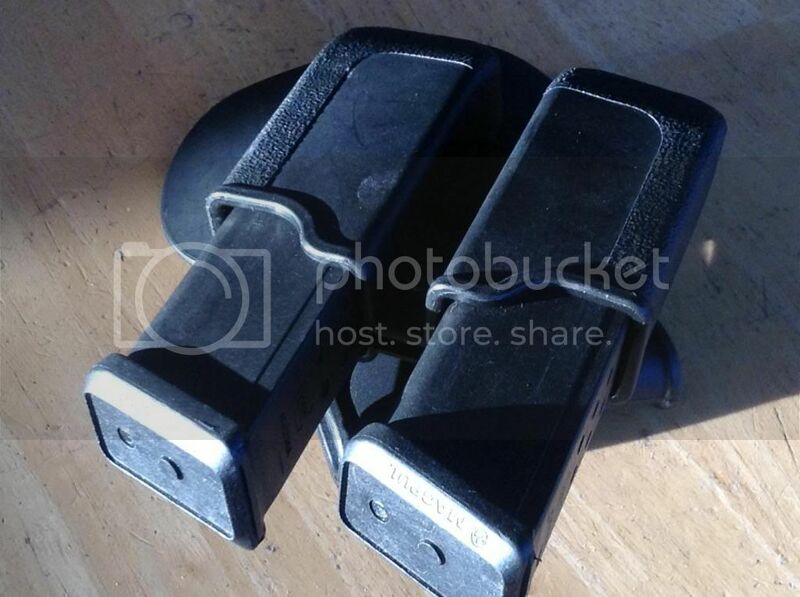 Its adjustable, and accommodates the vast majority of double stack pistol mags out there. The retention adjustment stays where you set it, and I have not needed to tighten it after about 10 months of use. I'm going to add some blue loc-tite for extra security, but so far the tensioning screw hasn't walked out without it, and the retention has stayed steady where I set it. The pouch adjusts 360 degrees around the paddle it is mounted on, so it accommodates most gear setups. Using a Safariland on my right hip and this on my left with the magazines canted slightly backwards allows easy access to both while wearing a chest rig. Again, we're not talking Raven Concealment level kit here, but it is adjustable in pretty much any way you could think of due to the rotational screw mounted in the center of the pouch. Here's what I really like about it though-you can run your magazines rounds forward or rearward without changing anything. Ok, I know I said the price was the best part, but if you change your gear setups around, thins thing works no matter what you do with it. There are pouches that cost ten times as much that become useless if you find out you like running your magazines a different way than you used to. Again, that's something you'll have to consider. This flexibility comes at a cost, though. The pouch sticks out a lot further than fixed Kydex pouches due to the adjustable cant. This makes concealment a lot more of an issue than some of the more optimized products out there, but it is doable, because I've done it repeatedly. Really though, this is not a system that's designed for concealment. So, is it durable? I haven't been able to break it yet. It's been dropped, stepped on, run into door frames, truck sides, rolled over onto, and it works as well as the day I got it. I'd like to note this thing survived when my SERPA belt paddle broke during a drill. I have to say I'm pleasantly surprised with this pouch. It does what it says it does, its durable, and it gives you a lot of options for running your magazines in different configurations. If you're looking for an economically priced dual magazine carrier for most modern double-stack semi-autos, I'd recommend you check out this pouch. I'll keep you posted on how it holds up.